New Adult novels, featuring protagonists aged 18 to 25 who are emerging into adulthood, have made a huge splash with readers. Get in on the fun in this four-week workshop. New Adult novels, featuring protagonists aged 18 to 25 who are emerging into adulthood, have made a huge splash with readers. They devour these books as quickly as they can get them. Even better, New Adult is one of those categories that has great potential to expand into other genres, so writers aren't limited to only college-set contemporaries. Are you a writer who wants to try your hand at crafting one of these novels? Maybe you remember your college days fondly and want to recapture that emotion. Perhaps there's a story idea battering around in your head that won't let you go, or a character who's telling you her story that needs to be written. Whatever your reason, this workshop—Intro to New Adult—can help you get started. Whether your end goal is self-publishing, e-publishing, or traditional publishing, this course will help you identify what's hot in New Adult, plot your story, develop swoon-worthy characters, and start writing that book! 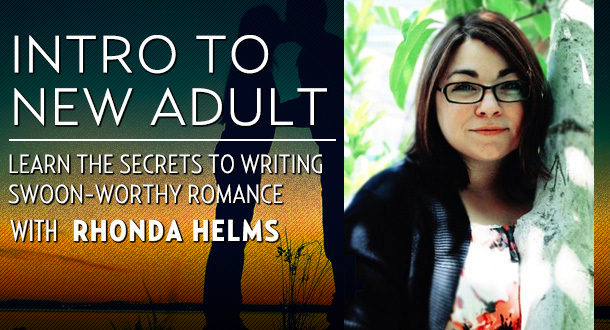 Rhonda Helms is an editor for Carina Press and a multi-published author for Simon & Schuster, Kensington and Berkley. She's also intimately familiar with New Adult romance—she both writes and edits it. This course consists of lectures twice a week, plus weekly homework of writing assignments. You'll start by discussing what New Adult is and isn't, and Rhonda will read your story pitches and help you refine them to be strong and compelling. Then, you'll rough out your plots so you can start cranking out those pages. Next, you'll hone your New Adult voice, learn to write compelling characters, and talk about developing romantic arcs. Finally, you'll discuss revision techniques and craft/style elements that will make your story stand out in the crowd. Along the way, Rhonda will be available to answer your questions—and she'll critique the first 30 pages of your story! * Class starts June 16—but there's still time to sign up and get caught up! Lecture One - What is New Adult? New Adult seems like an enigma to many people, so we'll discuss what it is and isn't, what genres/story elements are hot, heat levels, and more! By identifying the parameters of this category (not genre—we'll discuss the difference), you can start to hone your own story idea. We'll also discuss what Goal, Motivation and Conflict means, and how you can use these key elements to start building your plot. Assignment One, Write that pitch: What's your New Adult romance idea? Using GMC (Goal, Motivation and Conflict), come up with a 1-paragraph "pitch" for your book and send it to Rhonda for critiquing. Don't worry, it might evolve as you start working on your story, and that's okay. This is to help you get the ball rolling. Now that you have your basics for the story idea, it's time to do a crash course in plotting! You can use as much or as little as you want from Rhonda's nerdalicious method to figure out your story's plot—from crucial turning points, to the black moment, to the satisfying resolution. Assignment Two, Plot outline: Take your refined pitch and develop into a working plot outline, as general or detailed as you want. Rhonda's happy to take a look and offer feedback on the outline, as well (optional). One reason New Adult appeals to so many readers is the intimate voice. How do you capture that in your own writing? Rhonda will offer tips on how to make your narrative voice feel authentic, unique and compelling. Tied in with intimate voice is character. Is your Goal, Motivation and Conflict strong enough to make your characters stand out? Do your characters have compelling flaws, depth, and a strong enough arc to show real growth? We'll discuss how to craft characters who keep readers turning the page. Assignment Three, Critique: Write and polish those first 10 pages—Rhonda's ready to read and critique them! In a romance, the romantic arc is key. We're not only rooting for characters to achieve their personal goals, we're also rooting for them to overcome all the odds in their relationship and end up together in the end. This lecture will address how to develop your swoon-worthy romantic arc and keep the stakes building to its emotionally satisfying conclusion. New Adult is rich with intense emotion, one of the notable elements of this category. How do you make your characters, your plot, your stakes, your romance linger in the hearts of readers? We'll discuss methods you can employ to put your characters through the wringer and give your readers the emotional ride of their lives. Assignment Four, Critique: Write and polish those next 10 pages—Rhonda's ready to read and critique them! Writing is more than drafting--when your book is done, what's next? Rhonda will give her tried-and-true tips on what you should look for in your first round of revisions, starting with big-picture developmental elements of plot, pacing, character, setting, etc. After your big-picture developmental edits are done, your last step is to polish that sucker! Learn how to identify your crutch words and phrases, mix up your style method for sophistication and variety, discover a few common issues Rhonda sees in manuscripts, and more. Assignment Five, Critique: Write and polish those last 10 pages—Rhonda's ready to read and critique them! Define New Adult and craft your own plot in this category. Create compelling characters and hone your New Adult narrative voice. Discover what makes for a strong romantic arc and how to layer in emotional resonance. Enrich your writer's toolbox with tips and tricks on developmental and line editing. Draft and receive feedback on your first 30 pages. "I'm seeing RED and I like it! Rhonda's experience is apparent, whether you need line edits, content critiquing, or both. I got the works and I couldn't be more happy with the results... I plan to write for the rest of my life, and everything I write will go through Rhonda's edits." —Randall S. Sexton, Ph.D.